H2-Pro services Rosanna area 24 hours and 7 days a week. Call us now! Located about 20km west of Warrandyte, Rosanna is a small suburb bordering Heidelberg Heights, Macleod, and Watsonia. With 82% of homes in this small suburb classified as a “separate house” (as opposed to semi-detached or apartment, etc. ), the average age of homes here is understandably a bit older. And with an aging ouse, comes trouble with your pipes. In fact, your Rosanna home might be one of them! Whether you need a pipe replacement, an overhall of your home’s plumbing or are planning a complete renovation, talk to your local plumber in Rosanna for expert advice. H2-Pro delivers high-quality plumbing work and affordable hot water solutions that will improve your home’s plumbing system and your family’s safety. Call us now! Rosanna locals: now is the time to connect to Yarra Valley Water’s new sewerage system! Homes in several northeast Melbourne suburbs – including Rosanna, Warrandyte, and Eltham – built before the sewerage system are currently using old and outdated septic tanks. This is a health risk to the public and to our water. Now is the time to upgrade! Got a question? Get immediate advice from an H2-Pro plumber when you call us now: 9844 1444 Otherwise, please feel free to contact us here. Our experienced team of plumbers is available 24/7, every day of the year – and that includes public holidays too! We understand that plumbing disasters don’t wait until business hours to occur. Your water system is of huge importance to your ability to carry out your daily routine. So if your plumbing starts causing you problems, the team at H2-Pro is ready to respond. Need an emergency plumber in Rosanna? Call 9844 1444 now. 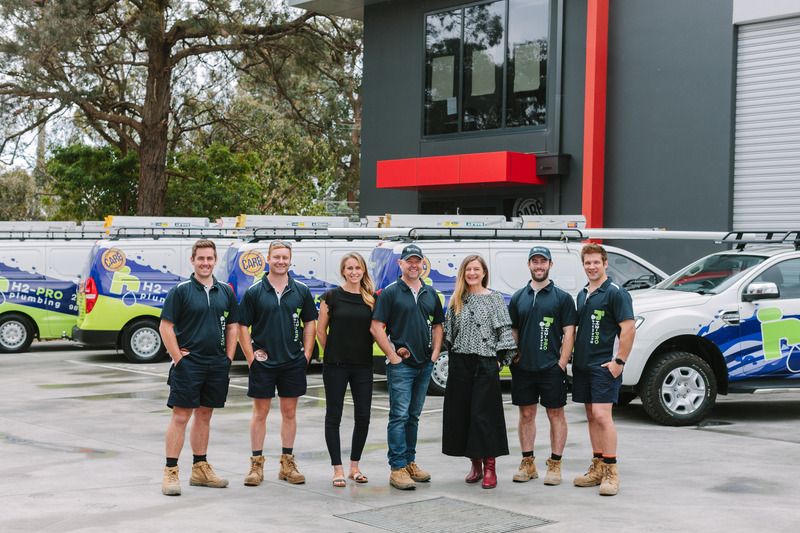 Over the years, the H2-Pro team has developed into one of the most trusted and chosen plumbing companies in Melbourne’s northeast. How can we help you? As homes age, their structural matter becomes more fragile and susceptible to damage and faults. Water damage can weaken a home’s foundation, not only causing unsightly cracks and roof or ceiling damage, but posing a potential safety threat in your home, too. Do you know the last time your bathroom was shown some love? Older structures are susceptible to expected wear and tear, and a rejuvenated bathroom can add an instant boost to the sale value of your home. With regular servicing, a hot water unit might last you a good 15-20 years… but in our experience, we’ve found many people do not get their hot water systems serviced as often as they should. Therefore, the lifespan can dramatically drop to five or 10 years. H2-Pro can inspect your current hot water system and provide realistic and honest advice. Emergency plumbing problems happen to all types of homes, whether they are old or new, and whether it is a single dwelling or apartment. Older homes, however, are faced with aging systems, including pipes, drainage, and sewage. Are you concerned about an element of your home’s plumbing system that needs immediate attention? Contact the H2-Pro team! Contact us today. Distance from H2 Pro? Searching for a reliable plumber in Rosanna? H2-Pro’s office is located just a few suburbs away in Warrandyte.